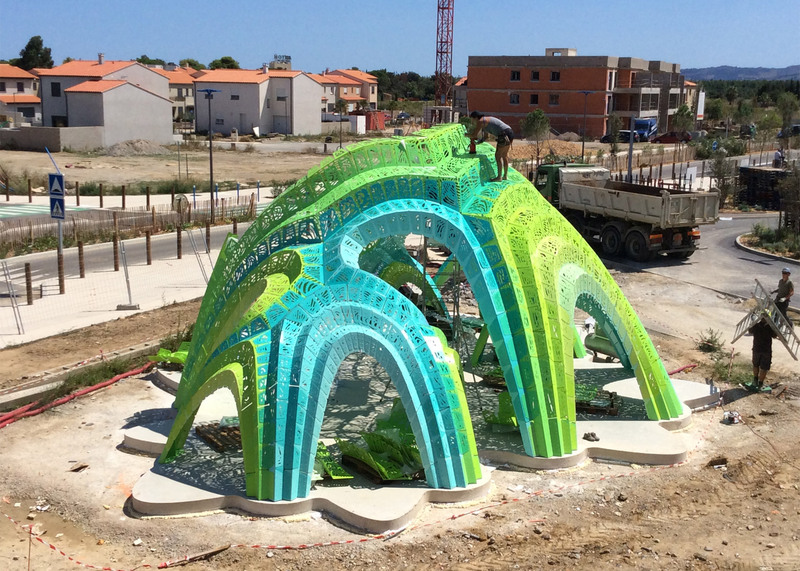 New York-based designer Marc Fornes has completed an outdoor installation for a French school, consisting of perforated aluminium plates that cast patterned shadows on the ground below (+ slideshow). Called Pleated Inflation, the permanent structure serves as an informal amphitheatre at the Lycée Christian Bourquin, a newly constructed high school in Argeles, France. Fornes, who leads the Brooklyn-based studio The Very Many, stitched together perforated metal plates to create the web-like canopy, which casts lacy shadows on the concrete below. 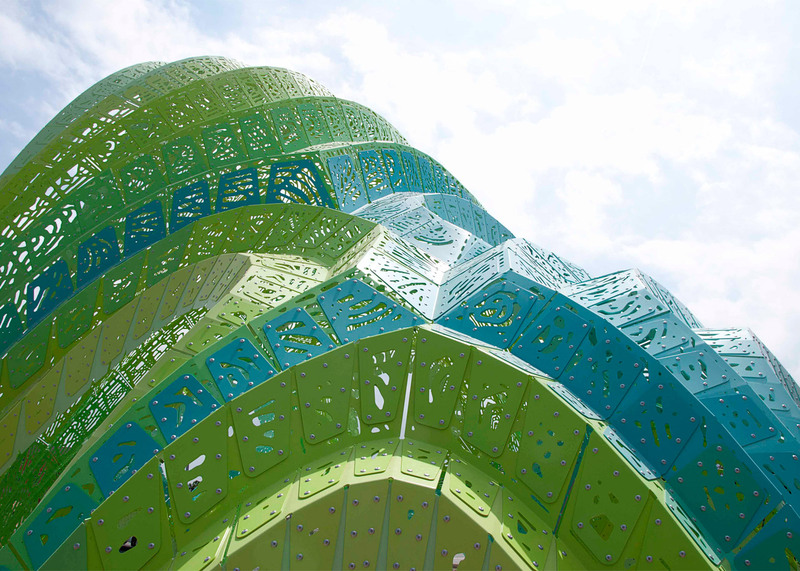 "Bringing together structural performance and spatial experience, the permanent installation immerses students of Lycée Christian Bourquin in ornate shadows cast from porous structural pleats," said the firm. 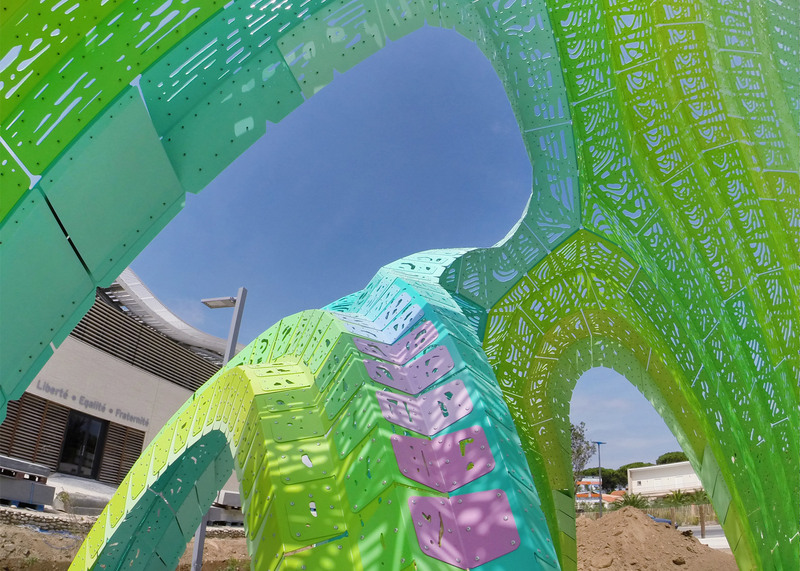 Fornes, who was born in France, is known for using computational design and digital fabrication to produce installations that are experiential and geometrically complex. Pleated Inflation is the next in a series of "structural shingle" projects by the designer. The series consists of lightweight, self-supporting systems that "unify skin, structure, ornamentation and spatial experience". 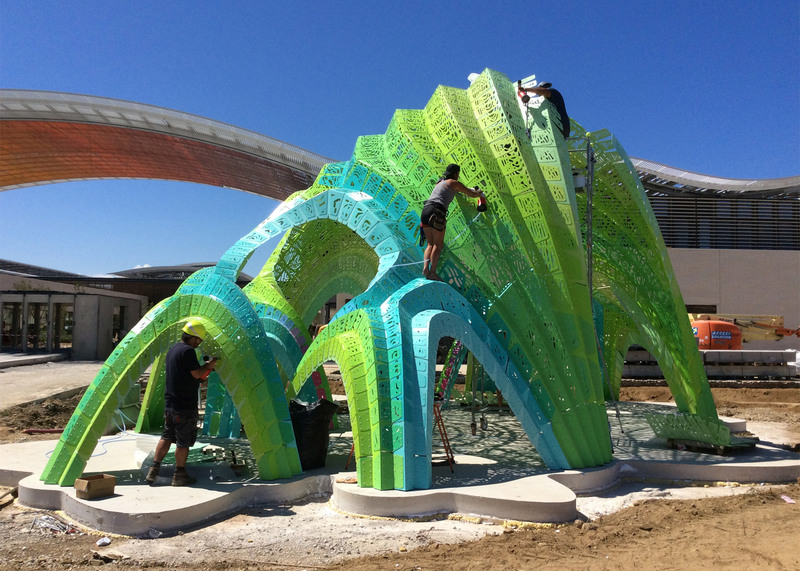 The new installation is made up of 990 multi-coloured aluminium shingles that are bolted together to form archways, columns and walls. The overlapping of the shingles creates rigidity and structural strength. The canopy – which measures 21 feet (6.4 metres) at its highest point and 46 feet (14 metres) at its widest – is anchored to the ground by 26 base plates. The form was computer-generated and the parts were digitally fabricated. 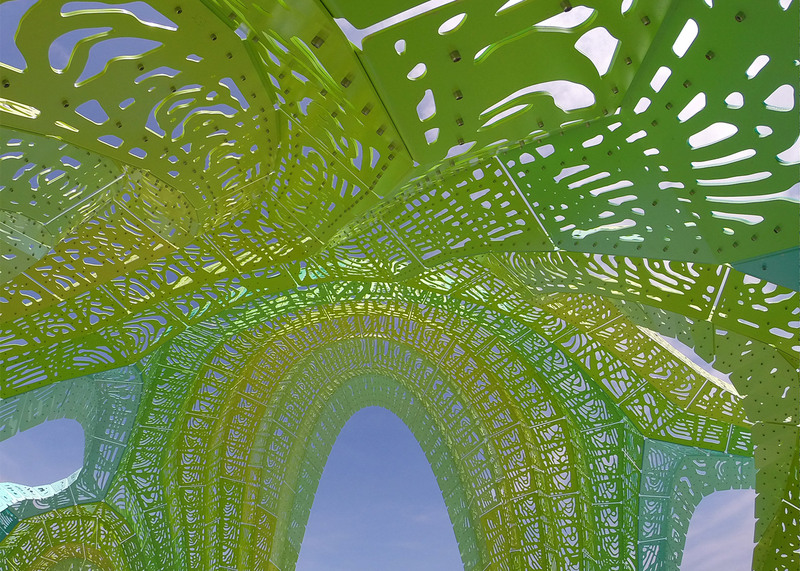 "The design was developed through custom computational protocols of structural form­-finding, descriptive geometry, and stress flow­-driven porosity," said the firm. 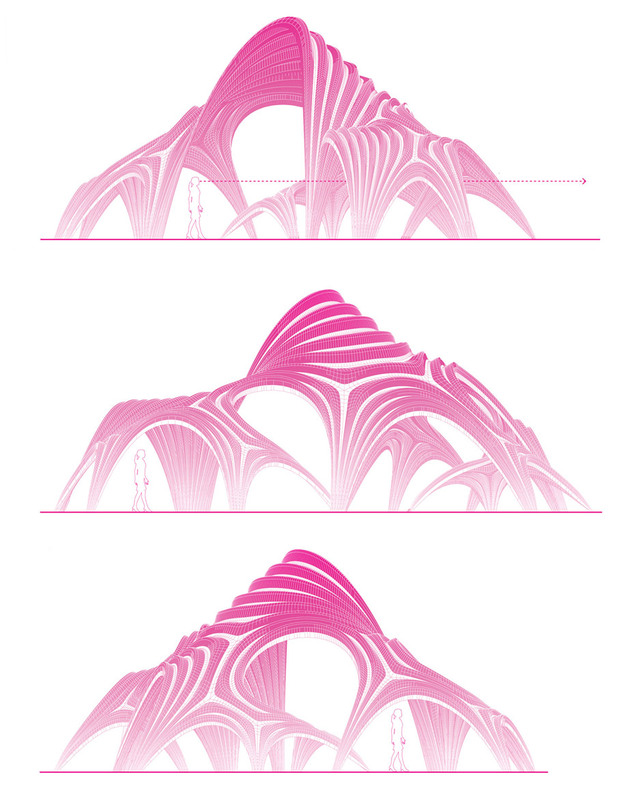 "A 2D network of lines as a footprint inflates and expands in the air, resulting in a voluminous space created with minimal lightweight material," the firm added. The installation was built over the course of four days by a team of four people. 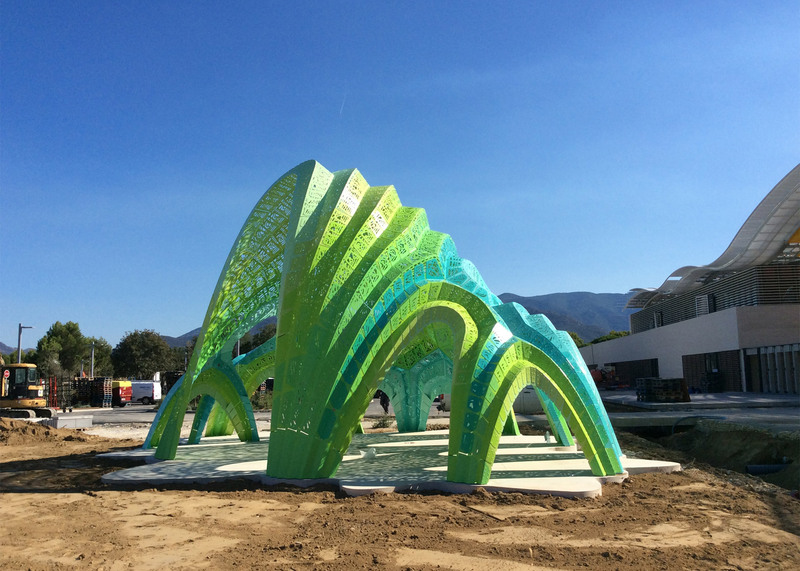 The project was commissioned by the governmental department Region Languedoc Roussillon as part of France's 1% Artistic program. Established in 1951, the program calls for spending one per cent of the budget for construction or renovation of a public building on artwork. Fornes founded his Brooklyn studio in 2005 after working for Zaha Hadid Architects and Skidmore, Owings & Merrill. 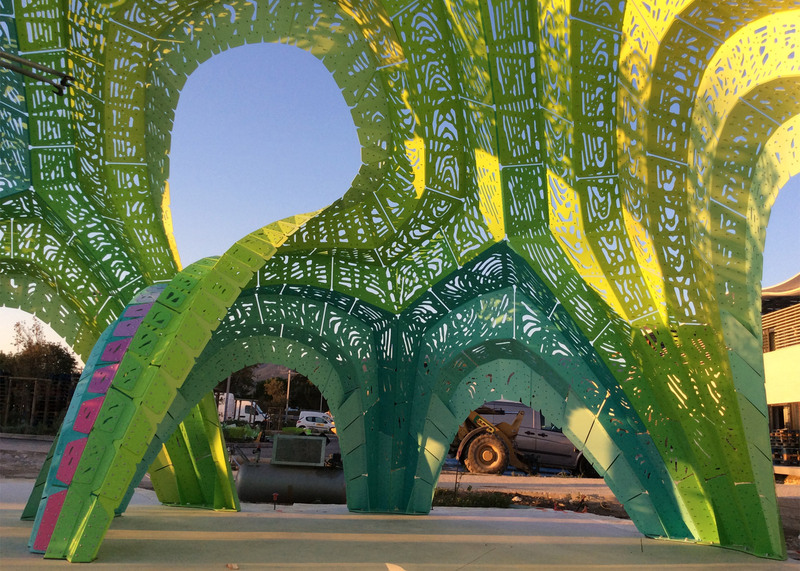 Other projects by Marc Fornes include a sinuous pink installation at the Storefront for Art and Architecture in New York and the NonLin/Lin Pavilion, which resembles a piece of coral. Photography is by The Very Many.